Have you all been waiting for this post to go up as much as I have? I was almost done trying out this unbelievably cute masks, when our family had such a bad streak of luck (hubby was in an accident with the semi, my grandmother was hospitalized, my Uncle passed away, and my grandfather just recently had a heart attack) that I just couldn't focus and took a break for a while. Things aren't quite back to normal, but I was able to finally find time to just relax. 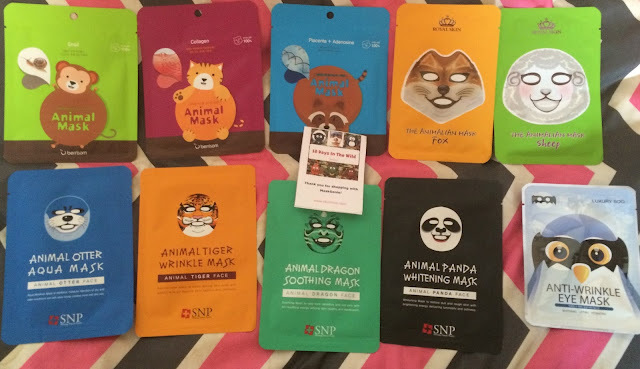 As you already saw by the title of this post, this is [finally] the review post from the MaskGenie "10 Days in the Wild" Special Edition Sheet Mask Pouch that I unboxed for you all a couple weeks ago. In my unboxing post you will also find a brief explanation about sheet masks, and MaskGenie. So lets move onto to the review, shall we? This is the photo from the unboxing post, showcasing all 10 masks included in this pouch. These unique masks were available from MaskGenie for a limited lime for a cost of $34 (including shipping, worldwide). Below you will find individual photos, photos of me with each mask on, and before and after photos of my skin. This panda sheet mask is supposed to bring luminosity to your face by restoring dull and rough skin and making it appear brighter. This was a very soft mask with a lot of stretch. I found it fit a majority of my face well but it was cut strangely around the nose area. I also noticed that the actual print of the mask was a bit off, and didn't line up with the cutouts for the face. The packet was loaded with essence that I was able to use on my neck and arms. This was a very moisturizing mask. I would say that it did have mild brightening qualities, but it definitely made my face feel refreshed. This sheep sheet mask did not give any specific "hints" as to what it might help your skin with, but all the Royal Skin masks say that will make skin moist and active. With that in mind, I just expected them to be moisturizing masks. I am continually drawn to the bold lines on this mask. I think it's a little hard to tell it's a sheep, but the bold lines are really cute. The fit of this mask was great, the print was made perfectly, and it fit my whole face perfectly. If you look at my forehead in the "after" photo you can see how moisturizing this mask really was. It was an excellent boost for my skin. It was also cooling and seemed to help tone down some of the redness I was experiencing from breakouts. This otter mask is supposed to restore moisture to dry skin to make it moist and silky. Like the panda SNP mask, this one was very soft and stretchy, with a weird fit around the nose. This print was better though. The packet was loaded with extra essence that I was able to use on my neck and arms. This mask made my skin feel super hydrated and plump. The essence kept my skin feeling hydrated for the remainder of the evening but my face never felt sticky. This tiger mask is supposed to boost dull skin cells with elasticity to make skin radiant and resilient. I love the bold print of this mask! It's very cute, and the print is perfect. The overall fit of the mask is great - not as stretchy as the previous SNP masks, but the fit around my nose was great. The packet was loaded with extra essence that I was able to use on my neck and arms. This mask had a heavy fragrance so I didn't keep it on as long as the others. This mask was cooling and refreshing for my skin, and provided a nice amount of light moisturization as well. This raccoon sheet mask contains placenta and adenosine; two ingredients which promote healing and regeneration when applied topically. When I unboxed this pouch, I was most excited to try this mask. When I see this mask, I do not immediately think of a raccoon. I think it's the red tone? But it is cute, and bold - I really am drawn to the bold masks more because that's what makes these masks so unique and fun in the first place, right? The fit of this mask was perfect for my face, and the little ears were a nice bonus (how cute are the little ears btw...). I look so awkward in these photos - haha - sorry about that! Overall, I really liked this mask. I was experiencing a lot of cystic acne (thank you hormones) and this really helped my face a lot. It relieved the painful swelling of the cysts, and made my face feel softer and more moisturized. In the morning my face looked renewed and my acne was almost gone. This fox sheet mask, like the sheep mask, just indicates that it makes skin moist and active. If I had to choose, this would be my least favorite print of all 10 sheet masks in this pouch. It's cute, but not as cute as the others in my opinion. The print is a bit crooked but not really noticeable, it does fit my face very well though. I actually really liked how small the eye holes were on this mask, because it was able to sooth my eye area as well without irritating my eyes. This was a very hydrating mask! Can you see the excess moisture on my face? Crazy! This essence did soak in nicely, and did not leave my face sticky at all. This was a great mask. You can also see how calmed down my redness is in the "after" photo. This dragon sheet mask is designed to soothe sensitive and red skin and make it healthy. Like the panda and otter masks, this sheet mask was very soft and stretchy, but the nose was much better fitted for my face. Overall this was such a cute print - Bug even wore it for a while after I was finished with it, the beautiful blend of colors almost makes it look tye-dyed. The packet was loaded with extra essence that I was able to use on my neck and arms. This mask improved the look of my skin quite a bit. 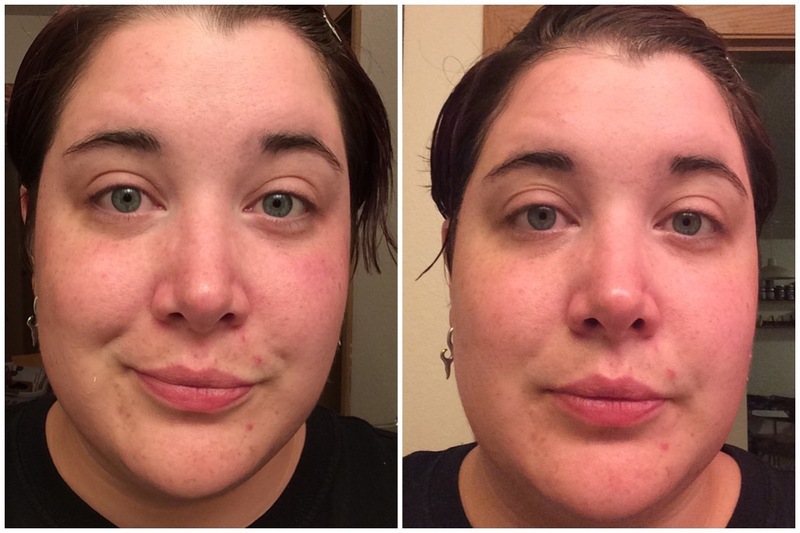 The redness from the "before" photo was gone and my face looked so much brighter after use. I was really impressed with the results of this mask. Aside from the new exciting ingredients from the Raccoon Berrisom mask, I was really excited for this one because snail mucin is my favorite skincare ingredient. It's moisturizing, soothing, renewing, and healing. It's played a huge role in combating my acne and it's helped with the signs of aging my face has been displaying as well. This sheet mask was very soothing and cooling on my skin. The fit was nice, maybe a little big, but the notches along the edges allowed me to easily fold it up to get a perfect fit. There was a very light scent, but honestly not too noticeable. And those monkey ears, so cute! This mask made my skin feel refreshed and hydrated after use. It soothed my red, irritated skin and helped calm my active acne. For a snail mask, it did not disappoint. I loved it! This penguin (or should I really just call it Batman) mask is designed to target the eye are to brighten dark circles, soothe puffiness and lines, and to hydrate the delicate eye area. This was a thicker mask but it was soaked in essence and stuck to my skin very well. It had a cloth-like texture that was easy to form and hugged my skin perfectly. I found this mask kept my skin hydrated and de-puffed for the day, and seemed to slightly lessen my under-eye lines, but not as much as I had hoped. It was very cooling and refreshing though. I enjoyed it a lot. There's something about the Berrisom masks and their unique ingredients that really make excited about this brand. The collagen is was my third choice to try from Berrisom because I had heard that it's not always effective when applied topically. But after seeing how amazing the Raccoon and Monkey masks were, I had high hopes for this one too. Kitty so cute! I love this print, it's cut perfectly, and the fit of the mask is pretty perfect too. I think the Berrisom masks are the best fitting of the whole bunch for my face. It had a very light scent, but it didn't bother me or my allergies. This mask wasn't overly effective unfortunately. Most sheet masks at the very least are hydrating, but this one did not provide much lasting hydration. I do think my skin was slightly firmer after use, but it left my skin a little pink too. So what do I think about this MaskGenie sheet mask pouch? Remember, MaskGenie has a monthly subscription that sends out a bag of either 5 masks for $12 or 10 masks for $22 - these prices include shipping, and MaskGenie ships worldwide! Be sure to watch the MaskGenie Facebook page for announcements about more special edition pouches, and for shipping notices about monthly pouches as well. What do you think of these animal print sheet masks?